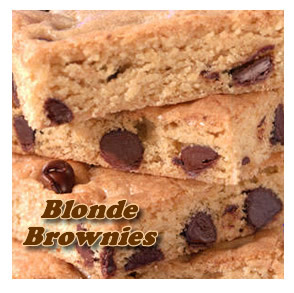 Have you ever tried blond brownies? As a mother, baking brownies on a whim becomes a weekly experience but sometimes I can't find the time, that's why these blond brownies are a hit! They are quick and easy and have my family begging at my feet for a taste. I believe that food not only feeds our bodies but also our souls. What better way to give you some uplifting than brownies? After years of begging for this blonde brownie recipe, my grandmother finally caved, and now I'll share it with you! The first thing that makes this recipe simple is that we keep the ingredients to the basics on hand. Of course, you can always add your own spin but these ingredients are things that are typically found in my cupboard at any given time! Before you start preparing your brownies pre-heat your oven to 350 degrees and grease your baking dish with 1 tbs of soft butter and set aside. In a large bowl mix together your dry ingredients first. Start with the flour and build up from there adding the brown sugar, baking powder, baking soda, and salt. Once the dry ingredients are completely mixed, then you start building up the flavors. Into the dry mixture add in the vanilla. One trick I learned from my grandmother is to add a little of the melted butter into the egg, not sure why it works but I always do it! Add in the egg mixture and the rest of the butter and stir well until it looks like brownie batter should. The last step is adding in the butterscotch chips. I always do this at the end so I have more control over them so they don't clump together at the beginning. You want every single brownie to have the same amount of butterscotch flavor. Once the batter is mixed to your satisfaction, spread it evenly into your baking dish and pop into the oven. These should cook up in around 20-25 minutes. Do the toothpick or skewer check by dipping the wood stick into the center of the brownies and if it comes out clean then you are ready to take them out. You should let these blond brownies cool before cutting into them so they don't fall apart on you. These brownies on their own are perfect but if you want to make them a little more special you can turn them into brownie sandwiches! What you do is if you have some butterscotch chips left over mix a couple of them in with some cool-whip and spread between two of the brownies to create your blond brownie sandwich. These are great treats for any play-date! Enjoy! Click here to share your own favorite brownie recipe!